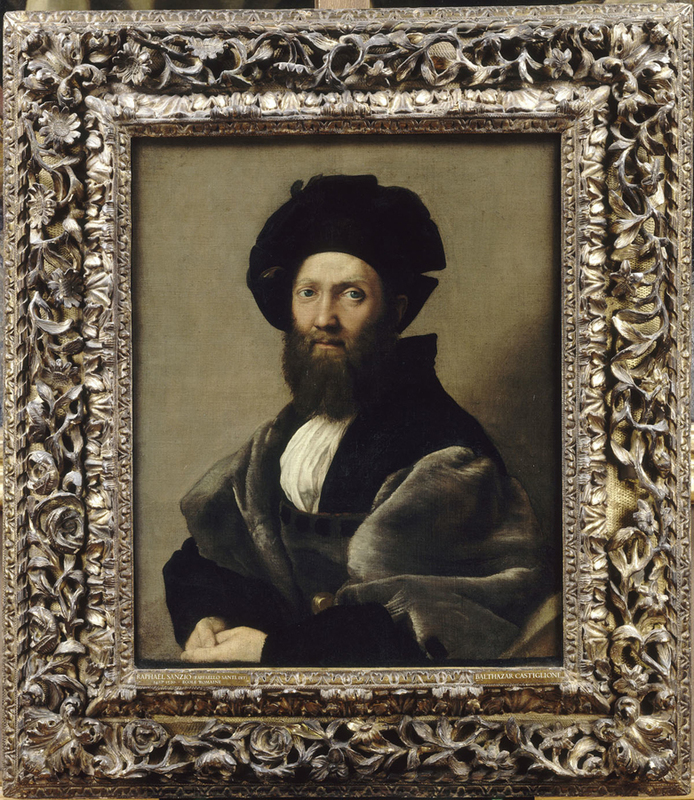 Jim Bennett, Managing Editor of the online resource, The Poetry Kit and its satellite magazines, responds to Raphael’s Portrait of Baldassare Castiglione and its frame; his poem introduces an account of this work. Raffaello Santi died (like Hasan himself) at the regrettably early age of 37. 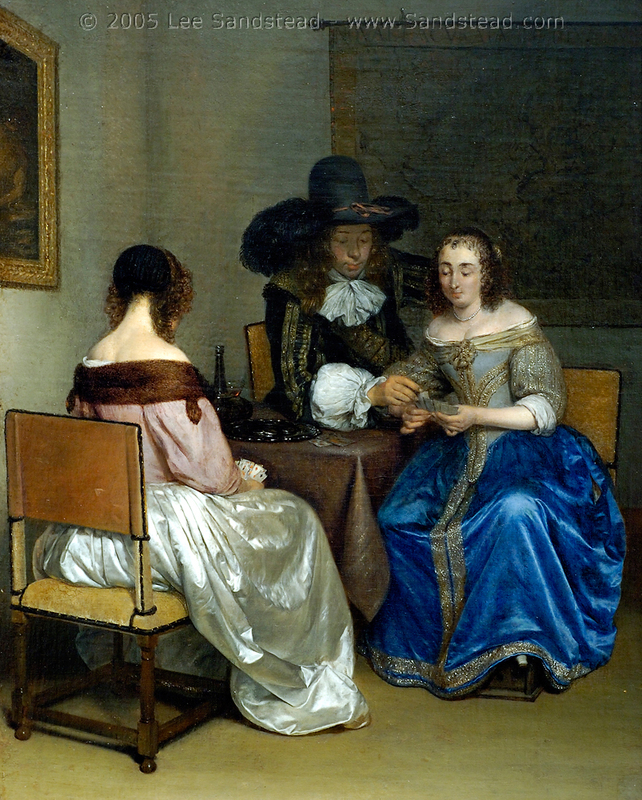 He had already accomplished a vast amount of work; its quality, combined with his short career, meant that his paintings were from the first extremely desirable to collectors, and thus they have tended to move about from collection to collection, perhaps even more than work by his peers. One of the results of this restless movement is that his pictures have been framed and reframed – often many times – and although works in major collections have by now (at least for the most part) been rehoused in frames of the correct nationality and period, very few paintings by Raphael are in their original settings. Paintings, by no matter whom – Rembrandt, Bronzino, Schiavone, Titian, Veronese – were all given these wide sculptural borders composed of Auricular ornament and marine motifs, rather as though they were precious gems whose consequence could only be enhanced by the richness of their settings. They include a pair of portraits attributed to Raphael, of Guidobaldo da Montefeltro and his wife, Elisabetta Gonzaga, which date from the artist’s first couple of years in Florence (now displayed in the Uffizi). These have both at some point been given ‘Medici’ frames, but not, intriguingly, a matching pair. The spare simplicity of the portraits might be seen as sitting oddly with the restless ornamentation of the frames, but the marriage works surprisingly well – like, indeed, the partnership of a cameo enshrined in a filigree border by a goldsmith and inflated to a giant scale. The breadth of the gilded borders helps to focus the spectator’s attention on the portraits, isolating and projecting them from their surroundings – an important consideration for a work which was part of the Medici collection. 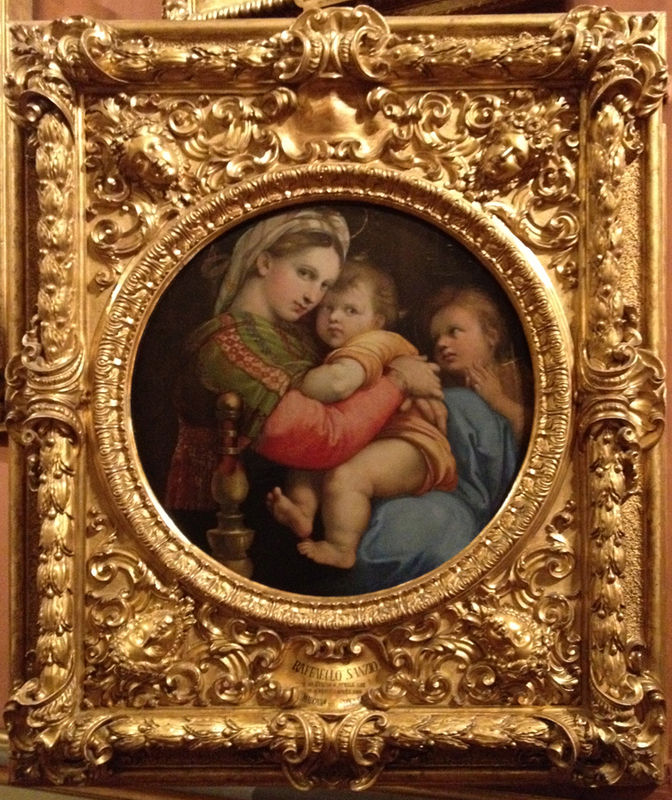 Another Medici-owned work by Raphael, the Madonna della segiola, which had entered the collection by 1589 but was not housed in the Palazzo Pitti until the 18th century, has been reframed in a later analogue of this voluptuously ornamented style, presumably so that it might be integrated as seamlessly as possible wherever it was first hung. It was painted in this frame by Zoffany in The Tribuna of the Uffizi (1772-77, Royal Collection), which is notable for the accuracy of his depiction of both paintings and frames (although the hanging was arranged by the artist, in order to include all the pictures he wanted). It is interesting to speculate how this very compact circular composition would have been framed in Rapahel’s day; he executed a number of tondi, but there seem to be few survivors even amongst this generally long-lived type of frame[ii]. The Madonna Terranuova in the Gemäldegalerie, Berlin, for instance, which appears to be authentically framed in a Tuscan design of the late 15th-early 16th century, is actually set in a replica frame carved in 1955. Raphael’s work was particularly open to solipsistic choices of frame by his patrons and later collectors, and divorces from its earliest settings. 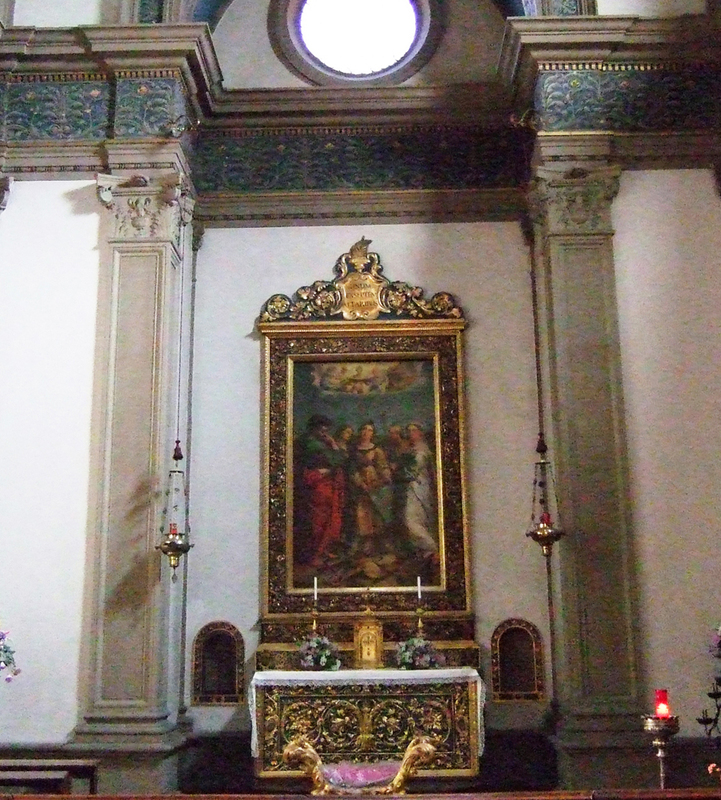 This has continued up to the 20th century, resulting in such anomalies as that of the St Cecelia altarpiece (1513-17) commissioned by Beata Elena Duglioli dall’Olio for the family chapel in S. Giovanni in Monte, Bologna. The painting was looted by Napoleon in 1793 and spent twelve years in Paris; when it was returned in 1815 it was installed in the Pinacoteca Nazionale di Bologna, and a copy of the original frame was made for it; the latter remains in situ in the chapel, and holds a 19th century replica of Raphael’s altarpiece. 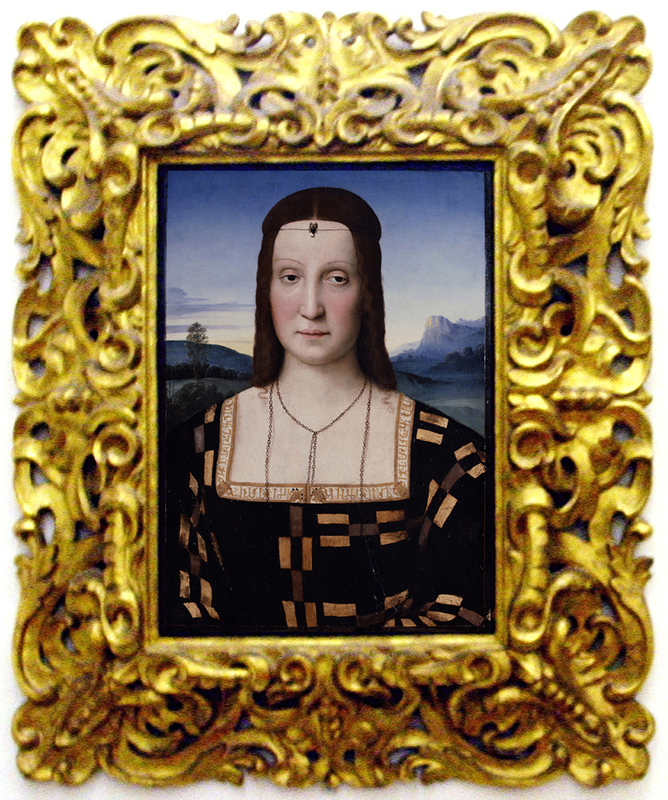 The antique frame has been generally ascribed to Andrea Marchesi da Formigine (1480/90-1559)[iii], although recently the workshop of Giovanni Barili has been suggested as a possibility for its production. The refined richness of its gilded decoration (on a blue-painted ground) is characteristic of the style known as ‘Formiginesque’, with its emphasis on tightly scrolling foliate and floral motifs, carved in low relief, with very delicate details. To separate this exquisite work by a master carver and gilder from the painting it was designed for seems a particularly bizarre decision, and would not in all probability have happened but for Raphael’s fame, and the charismatic aura which attaches to his work. The replica frame in the gallery lacks the ornamental crest seen above, which rises above the open vista into heaven at the top of the painting, and acts as a focus, in its carved and gilded lamp, for the upturned gaze of St Cecelia. Ten years later Castiglione was sent by Pope Clement VII to Madrid as a papal nuncio, and it has been suggested that he might possibly have taken the portrait with him[v] – his young wife had died after four years of marriage, and he had more reason to take the portrait than to leave it in Mantua. At this point it would most likely have been set in an early cassetta frame, and the natural complement of the subdued colouring of the portrait would probably have been some combination of parcel gilding with black tempera. In 1529 Castiglione died in Toledo, of the plague. Either at that point or earlier (if it had not remained in Mantua all the time), the portrait seems to have been dispatched back to his home, where Antonio Beffa Negrini noted two portraits by Raphael[vi]. Nearly sixty years later, Castiglione’s son, Camillo, wrote to the great-grand nephew of the Guidobaldo da Montfeltro (above) whom Raphael had also painted – Francesco Maria II della Rovere, Duke of Urbino. 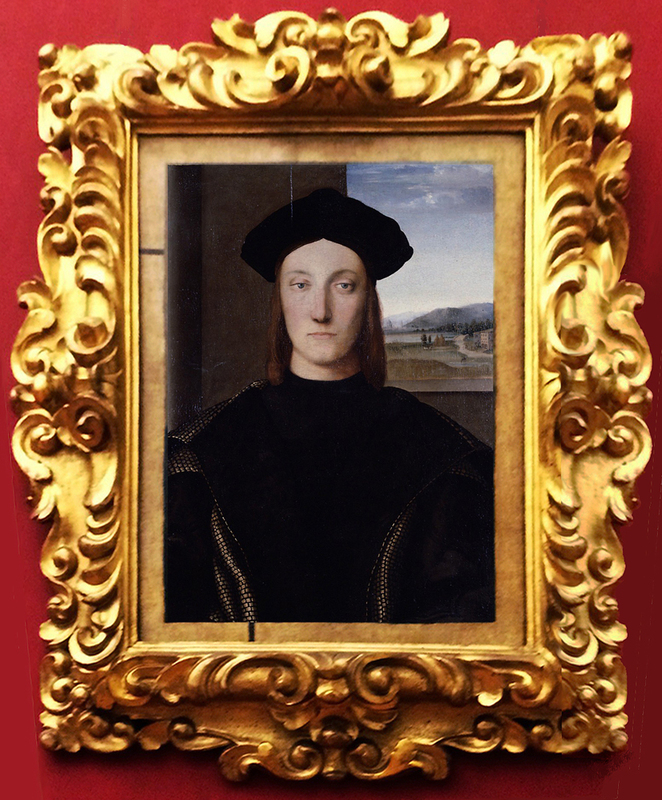 He offered him the portrait of his father, in memory of the latter’s days at the court of Urbino, so that it could remain under the protection of its prince, and the Duke seems to have accepted it [vii]. Francesco Maria II died without a male heir in 1631; although half his estate was left to his granddaughter, some of his possessions appear to have been misappropriated and auctioned, and among these Raphael’s Portrait of Castiglione must have figured. This seems to have been its route into the hands of Lucas van Uffelen, a banker living at that point in Venice but shortly to return to Amsterdam, and from whose collection it was auctioned in 1639[viii]. The portrait may very well have been reframed from its original setting by either or both these men, in order both to lay claim to it and to update it. Rembrandt, who sketched the portrait at the 1639 auction, made no suggestion of a frame, although it is unlikely to have been sold without one. It was bought at the auction by Alfonso Lopez, a Portuguese agent for the French King, for 3500 guilders[ix] (or about £33,000 in present day terms), who sold it in 1641 to Cardinal Mazarin[x]. Mazarin’s collection became a target for Louis XIV’s ambitions, as a symbol of status and power, and on the death of the Cardinal in 1661, the king acquired 34 of his paintings, including the portrait of Castiglione. There are several points at which this spectacular frame could logically (and chronologically) have been married to the painting. It might have been specially made in France for Lucas van Uffelen (Dutch collectors did sometimes employ grand-luxe French frames); created during the two years the portrait was in Lopez’s hands, to make it more saleable; or ditto, as an affirmation of status on entering Mazarin’s collection at the beginning of the 1640s. It might have been purchased whilst the painting was in the collection of the crown; or in 1788/89, when it was transferred from panel to canvas before being presented to the Louvre in 1791; it may have been acquired by the museum, of course, but this appears less likely. As regards the first two possibilities, information from inventories in Patrick Michel’s Mazarin, Prince de Collectionneurs, 1999, may indicate that this particular frame was not bought nor commissioned by the Cardinal for the portrait, and therefore had probably (although not certainly) not been previously applied to it. The 16th century portraits which Mazarin owned were generally set in parcel-gilt black frames, with what were then considered ‘higher’ forms of art (sacred and history paintings) in carved and gilded patterns. The portrait stayed in Louis XIV’s possession from 1661 until his death in 1715; however, it did not then pass seamlessly to his infant heir. The Duc d’Antin, legitimate half-brother of the illegitimate children (by Mme de Montespan) of Louis XIV, purloined a quantity of ‘exquisite paintings taken from the king’s collection’ after the latter’s death, including the Castiglione, which hung in his bedchamber, along with Raphael’s 1518 Holy Family and twenty further great paintings[xi]. The duc kept this hanging (although it was only supposed to be temporary) for two decades; the Hôtel d’Antin became an important locus of Italian paintings, especially of the 16th century[xii]. There is no indication that he was responsible for reframing the portrait; although he acquired (and also filched) paintings, he was not essentially a collector. He was, however, head of the Bâtiments du Roi (from 1708-15 under Louis XIV, and then from 1715-36 under the regent, Philippe d’Orléans); this was the department of craftsmen who maintained, created and decorated the buildings and interiors of the royal apartments. There, his commissioning of fine art for the French palaces seems to have been less than imaginative; in contrast, the carved boiseries produced under his aegis were spectacular and important[xiii]. Although Candace Clements notes that it is difficult to see how much this was due to the taste and leadership of the duc himself[xiv], it is possible that he was personally more interested in the creations of the maître sculpteurs responsible for the woodworking output of the Bâtiments than in his hoard of paintings. Perhaps he found the Castiglione frame on some other painting and filched it, as he had taken the portrait itself; perhaps one of the carvers found it for him in their own stockrooms. Its quality is apparent even to the casual observer. 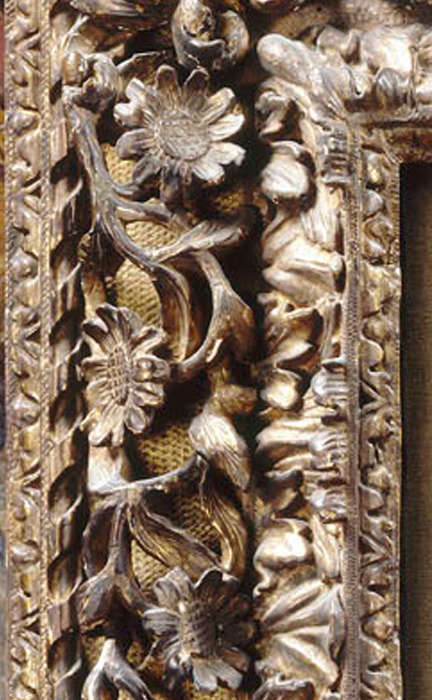 It has the structure of a cassetta frame, with matching borders of acanthus leaf-tips on a hazzled ground at the back edge and sight edge (‘hazzling’ is that zig-zag pattern engraved in the gesso). 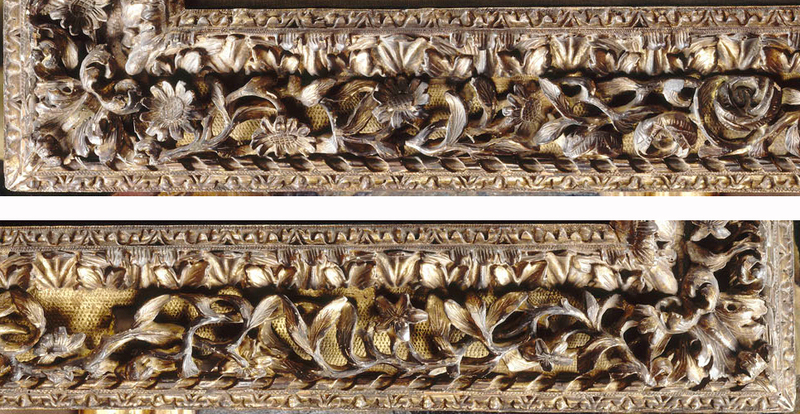 The central frieze is engraved with cross-hatching, and then overlaid with the high-relief sculpted and pierced band of flowering vines. These contain sunflowers, roses, and cherry blossom, each of which can be interpreted both through secular and religious symbolism (a Renaissance flower is very unlikely to be used merely because it’s pretty). The meaning of the sunflower rides on the Greek legend of Clytie, who fell in love with Apollo, god of light, and was changed into a flower which turned its head to watch the progress of the sun’s chariot across the heavens. This easily became a symbol for the man or woman who follows Christ, as well as for the follower of Apollo in his guise of patron of the arts (i.e. a poet, musician or artist will often have a sunflower around somewhere – Van Dyck, Van Gogh). The rose is an attribute of the Virgin Mary, and also of Christ’s Passion, as well as of faith; in secular terms, it is the flower of Venus, standing for love and sorrow, and fidelity, again. Cherry blossom is associated with the Eucharist, through the blood-red juice of the cherry, and with the Resurrection through its early flowering after winter; it also stands for the sweetness of charitable acts [xv]. Both strands of symbolism support without elucidating the history of the frame. If it had been commissioned for the portrait of Castiglione (by Lucas van Uffelen, Lopez or Mazarin), then these flowers are all suitable for a noted writer, poet and diplomat; a faithful servant of his prince and the Pope; the devoted husband of a young wife who died too soon. But they might just as easily apply to an early 17th century French painting of the Madonna and Child, possibly displaced from a chapel for a newer sacred work, and then also displaced from its frame. The likelihood seems perhaps fractionally on the side of the Duc d’Antin having set such a prestigious painting in an empty frame which serendipitously fitted it. 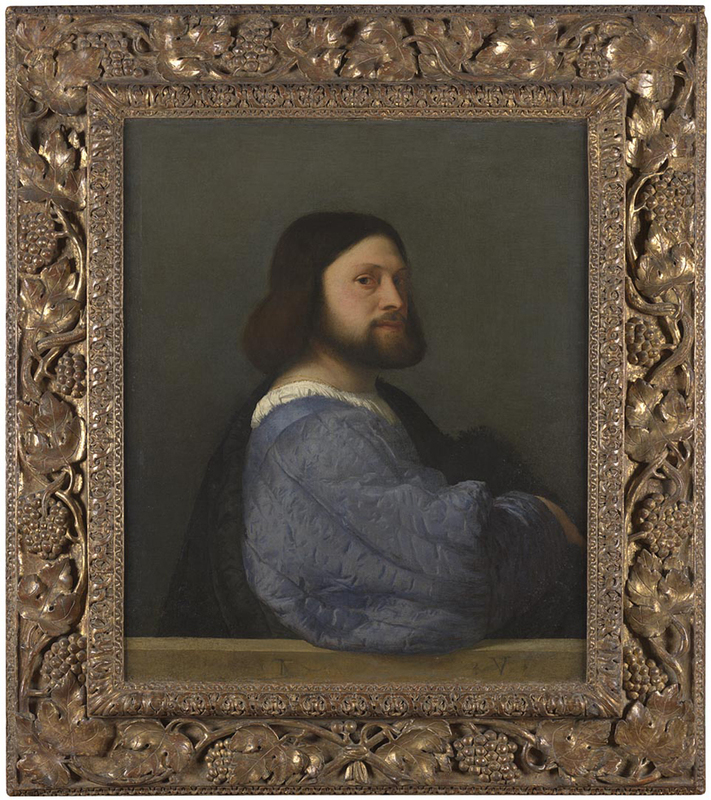 An interesting and lateral connection arises with Titian’s portrait in the National Gallery, London, known at various points through its history as a Portrait of Ariosto, a Self-portrait, The man with the quilted sleeve and The man in blue, but most recently, picking up on Vasari’s reference to it, as Portrait of Gerolamo Barbarigo. Probably painted four or five years before Raphael’s portrait of Castiglione and with a rather similar composition, it also has a spectacular French Renaissance-style frame, carved with a vine in high relief (here an actual grapevine, laden with bunches of grapes). Both portraits were the work of comparatively young men (Raphael was about 30 and Titian very young, at around 20); the subjects of both were men with political careers and literary connections; and both paintings passed through the hands of Alfonso Lopez in the 1630s [xvi]. The coincidence that both should also have been placed in related frames carved with three-dimensional garlands of foliage and flowers, or foliage and fruit, is rather extraordinary, and requires more investigation. All that can be stated about the frame of Raphael’s Castiglione at the moment is that it’s French; it dates from around 1625-50; it may have been commissioned for the painting by Lucas van Uffelen or Alfonso Lopez, or on behalf of Mazarin or Louis IV, with a very slight bias towards the Duc d’Antin; it may be a happy conjunction of taste and acquisition under a later jurisdiction. It’s also a spectacularly beautiful object, which sets off the equally beautiful painting it contains as though it were an actual garland of flowers. Jim Bennett lives near Liverpool in the UK and is the author of 63 books, including books for children, books of poetry and many technical titles on transport and examinations. His poetry collections include: Drums at New Brighton (Lifestyle 1999), Down in Liverpool (CD) (Long Neck 2001), The Man Who Tried to Hug Clouds (Bluechrome 2004 reprinted 2006), Larkhill (Searle Publishing 2009), The Cartographer / Heswall (Indigo Dreams 2012). He has won many awards for his writing and performance including 3 DADAFest awards. He is also managing editor of www.poetrykit.org, one of the world’s most successful internet sites for poets. Jim taught Creative Writing at the University of Liverpool and now tours throughout the year giving readings and performances of his work. Hasan and I were going to work together on the frames of Raphael’s paintings, and incorporate details of them, where possible, into his entries on Open Raphael; I hope that he would have approved of this piece. He is hugely missed and deeply regretted. Thank you to the institutions who have kindly helped with images – the Musée du Louvre, the National Gallery, and the Polo Museale Fiorentino. [i] Marilena Mosco, ‘Les cadres de Léopold de Medicis’, Revue de l’Art, no 76, 1987, pp.37-40. [ii] The frame of the Conestabile Madonna in the Hermitage is supposed to have retained its original frame, which is even described, here & there on the internet, as having been designed by Raphael; other sources more circumspectly suggest that, having been transferred from panel to canvas, the picture is ‘now in a frame which might be the original one’. It’s certainly a very beautiful design, even if it looks more like a restello (and very possibly a Venetian restello) than a picture frame. [iii] Claus Grimm, Alte Bilderrahmen, Munich, 1977 & 1979, p.72. [iv] Stephanie Dickey, ‘Rethinking Rembrandt’s Renaissance’, Canadian Journal of Netherlandic Studies, XXI, 2007, p. 2. [v] Sabine Eiche, ‘The return of Baldassare Castiglione’, The Burlington Magazine, CXXIII, March 1981, p. 154. [ix] Dickey, op. cit., p.4. [xii] The Hôtel d’Antin, later the Hôtel de Richelieu, was on the right-hand side of the rue Louis le Grand, running up to the boulevard des Italiens. It has disappeared (garden and all) under a vast building with a shiny granite groundfloor and gigantic fluted white columns above. [xiii] Candace Clements, ‘The duc d’Antin, the Royal Administration of Pictures, and the painting competition of 1727’, The Art Bulletin, LXXVII, 4, Dec. 1996, p.651. [xv] Mirella Levi D’Ancona, The garden of the Renaissance: botanical symbolism in Italian painting, Casa Editrice Leo S.Olschki, 1977; and helpful extracts from this. [xvi] Dickey, op. cit., p. 4. Titian’s portrait was parted from Raphael’s after this brief encounter; the Titian may have been acquired by Van Dyck, as a portrait of Ariosto by Titian turned up in the artist’s effects in 1644. Lord Darnley of Cobham Hall had acquired it by 1824; it was finally sold out of the family in 1903 to Sir George Donaldson, and then to the National Gallery in 1904. These last movements are documented in the National Gallery Archives, where there may be a mention of the frame. This is a marvelous blog — many thanks to you for so much excellent information! Thank you for such a kind comment – very much appreciated! What a great post! This is a fun and unique contribution among the other Raphael posts that have been written as a tribute to Hasan over the past few days. I’m particularly intrigued by quote that mentioned a “horror vacui” attitude toward space in the “Medici” frames. To me, Raphael’s compositions often seem calm, spacious, and even expansive. It is interesting how some of these visually “busy” frames can therefore go against the visual tenants of the art that is displayed. But yet, at the same time, I feel like the decorative nature of the frame really helps the eye to focus on the displayed canvas or panel, too. 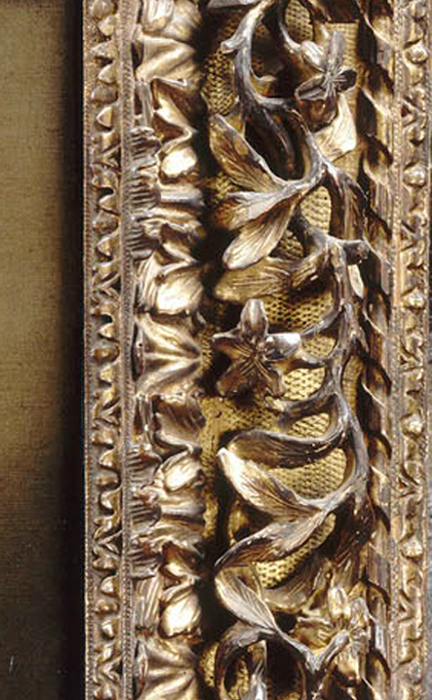 On another note, the details of the Castiglione frame are gorgeous! I love all of those flowers. The ‘Medici’ frames are interesting in that they both contribute to the overwhelming decorativeness of the Pitti Palace, but also create these individual pockets of space for the paintings they house – it’s a peculiar paradox. It’s so easy to think when you go in, ‘Oh – this is all far, far too much’, but as you start to look at the paintings themselves I think that you do see them as islands, projected by their fabulous golden settings. There’s a drawing in the Uffizi by Giovanni Battista Marmi which shows part of the hang of these works in the time of Cardinal Leopoldo de’Medici, so you can appreciate how carefully the whole scheme is worked out. I was fascinated by your post on the Domus Aurea & the Loggia, as Udine is seen (to frame historians) as the source of arabesque decoration on frames of the period! 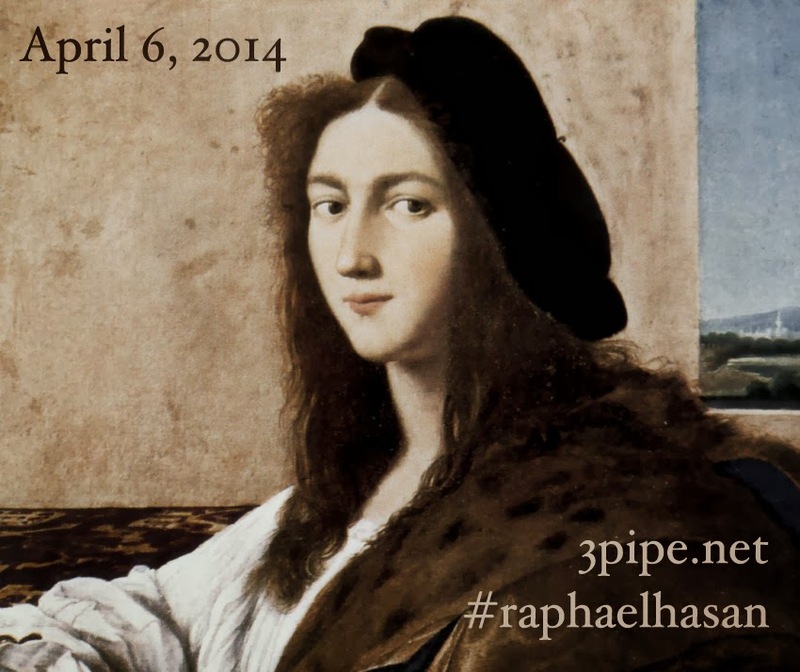 There are no Raphaels or copies after Raphael in Macedonia where I live. But if you want, next time I go trough Serbia and Croatia I will take a few snaps of the Raphael frames there, and of other nice frames. Thank you – that’s very kind indeed, and I do appreciate it. Collecting clear images of frames on paintings is the most difficult aspect of this job, and I’m extremely grateful for any help you may be kind enough to give. I should also be particularly happy to have photos of frames from Serbia & Croatia, as these are especially scarce for me, over here. Altarpieces in churches (with the name of artist & church) are also very welcome: often altarpieces in small rural churches retain their original frames, where those in larger churches and cathedrals have been broken up, sold, or moved into museums… Thank you! I did my thesis on Croatian patronage of Italian Renaissance Paintings and have a few photographs of things you might like. Is there an email where I can send you things? Oh, goodness – yes! how very nice of you! Would you mind, perhaps, going to the ‘About’ page, clicking on my name & going to my ‘Contacts’ page? I’m sorry to be so roundabout, but the spam generated by this blog is already vast, whilst my website seems to have exhausted most of the spammers. Thank you again – am so pleased to have encountered you. Nice post. I love the website and can’t wait to go through the archives. I always had an interest in frames but never really pursued it. Would you please suggest a reading list on the history and development of frames. I already have N. Penny’s Frames in the NG, T. Newbery’s Frames and Framing and your book with P Mitchell, A History of European Frames. I’m glad that you enjoyed the post, and thank you for taking the time to comment. 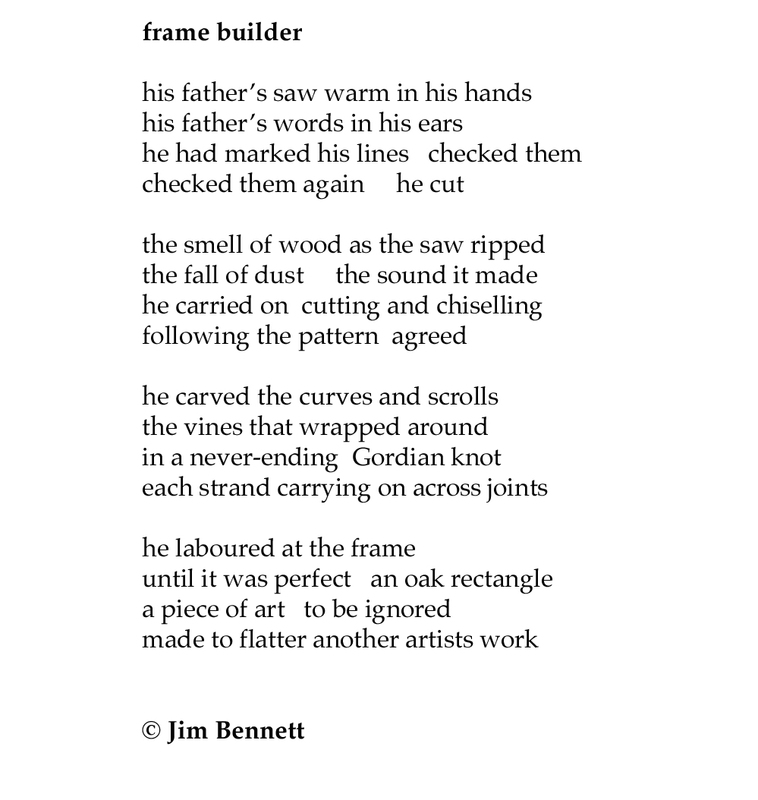 As for a reading list, the best thing I can do is to point you towards the bibliography on the frame section of the NPG website: http://www.npg.org.uk/research/programmes/the-art-of-the-picture-frame/research-bilbiography.php . This is divided into nationalities, with a general section, one on frames for prints/drawings/&c., a technical bit, and a final group of books on collections. It includes articles and papers, as well as books (some of the latter are now unfortunately out of print, but you should be able to find them through a library). My father is an artist and I was always keenly aware of how important frames are. But I also have to point out that at no time during my official schooling (I have a Bastards, a MLitt and a PhD in art history), did any one of my professors ever talked about frames, or even mentioned them. On another note, even thought I’ve been to London a few times I’ve never really taken my time in the Portrait Gallery (which apparently has a great/very useful web site); this despite the fact that a painter really only shows how much he knows and how good he is in portraits (there is just no way for one to hide his inadequates and shortcomings in portraits). After reading your post on Raphael I also looked at a few others, and both the interview with Peter Schade and the one on the miracle of Cortemaggiore are simply brilliant. In a way, even though he is gone, Hasan is still doing what he did best, connecting people. Frames weren’t considered to be important enough to be included in any teaching on fine art for all of the 20th century, really, and it’s still an uphill job to get institutions and museums to take them seriously. Fortunately there are some enlightened people, like Nick Penny at the National Gallery; and Jacob Simon built up the frame section on the NPG website into a really useful tool for frame research. If you visit the NPG, you’ll also find the best cache of British frames anywhere, simply because of the scope and focus of the Gallery.